1. It gives me immense pleasure to be here this evening at the Manekshaw Centre for inaugurating the Commemorative Exhibition on the theme, “India and World War – I”. At the outset, let me compliment the Indian Armed Forces for organizing this exhibition to walk down the memory lane to recognize and celebrate the bravery of the Indian soldiers who laid down their lives during the First War. 2. The centenary of the First World War is an important landmark in world history. This occasion reminds the world community of the immense loss of life and material that the world had to endure in pursuit of global peace and stability. In this effort the Indian soldiers played an important role in the various theatres of the War. The Indian contribution of a volunteer army to the war effort was large in comparison to many other contributing nations. 3. During the War, Indian soldiers were in active service on virtually every war front. They carved a niche for themselves by their outstanding loyalty, courage and selfless service and played a significant role in influencing the outcome of the War. The Allied Forces were also in a position to sign an armistice because of the support of the Indian soldiers. 4. A hundred years ago, the world was different. Even though our country was under colonial rule, Indian soldiers etched their name in world history through their bravery and valour. The gallantry of the Sikhs and Gurkhas in the battlefields of Gallipoli is well-known. So is the bravery of the Garhwali, Dogra, Punjabi and Maratha Soldiers, who fought in the battlefields of Flanders and Somme. These soldiers not only won the pickets and trenches but also the hearts of the local population. The humble upbringing of these soldiers in their villages, the teachings of the Ramayana and Mahabharata, infused in the Indian soldier’s conscience a strong set of values – the value of being ‘just’ in their dealings with those whom they have vanquished and of ‘resolute stance’ against the adversary when under siege. These values made them a formidable fighting force. 5. There are numerous battles of this War which highlight the perseverance of the Indian soldiers where along with the British battalions they stoically withstood the fierce attacks of their adversaries. It was for the fine soldierly attributes that by the end of the Great War, the Indian soldiers were decorated with 11 Victoria Crosses, 5 Military Crosses and numerous other awards. 6. To my mind, these men made their sacrifices with a sense of pride and righteousness. This needs to be recognized and celebrated. Today, we pay our respects and honour these men. 7. A hundred years ago, the youth of many a nation was wasted on account of human greed and misguided notions. Today, conflicts arising out of pernicious designs of some terror outfits are claiming thousands of valuable lives in many parts of the world. The rise of non-state actors and lethal terrorist entities is a threat to our nation. 8. The Armed Forces of our nation are capable of meeting all challenges and threats to our national integrity and contribute to world peace and security. We have developed an effective deterrence and stand ready to defend our territorial integrity. The professionalism which our armed forces display today is a continuation of what was so bravely exhibited by the Indian soldiers in the First World War. 9. It is to acknowledge the role played by the Indian soldiers during this historic War, that this Commemorative Event has been organized. It will remind us all once again about the sacrifices made by our valiant soldiers and the role they played for peace and security in the world. I once again compliment the Indian Armed Forces for organizing this memorable event. I wish all of you the very best for the future. 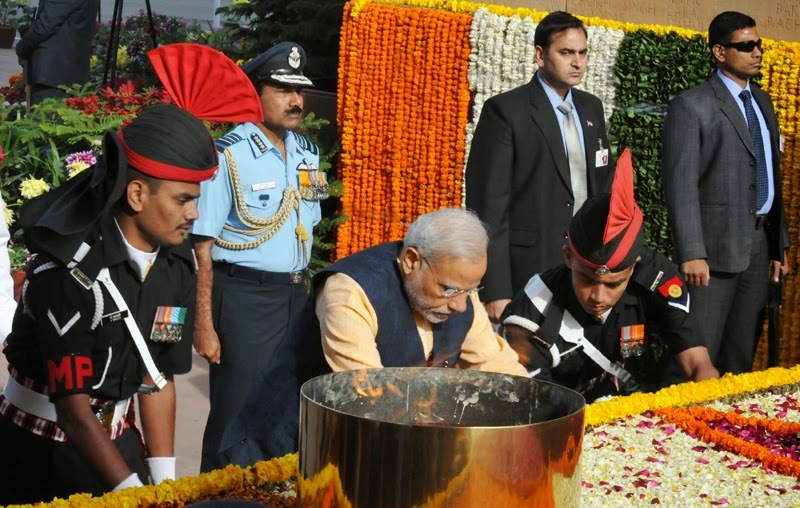 Indian Army is Commemorating the Centenary of the First World War from 10 Mar to 14 Mar 2015 in New Delhi in memory of the 1.5 million Indian Soldiers who fought in the war and over 74000 who made the supreme sacrifice. 10th March coincides with the Battle of Neuve Chapelle marking the British Offensive in Artois region of France in which the Garhwal Brigade & Meerut Division of the Indian Corps participated. 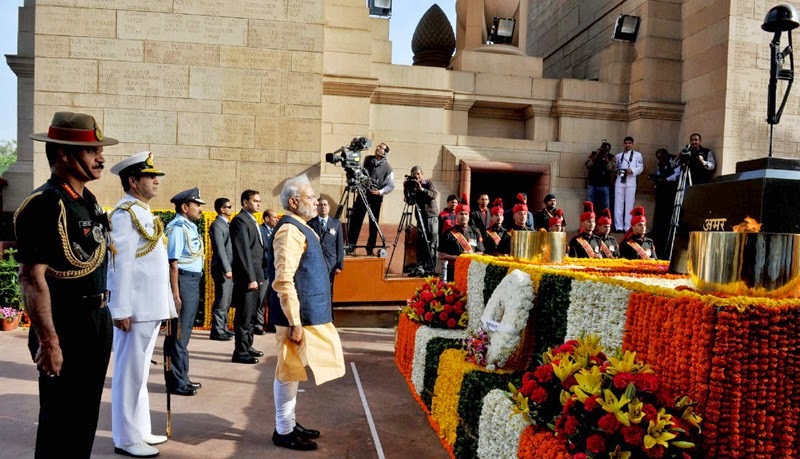 The time period 2014 to 2018 is being commemorated as the Centenary of World War-1. 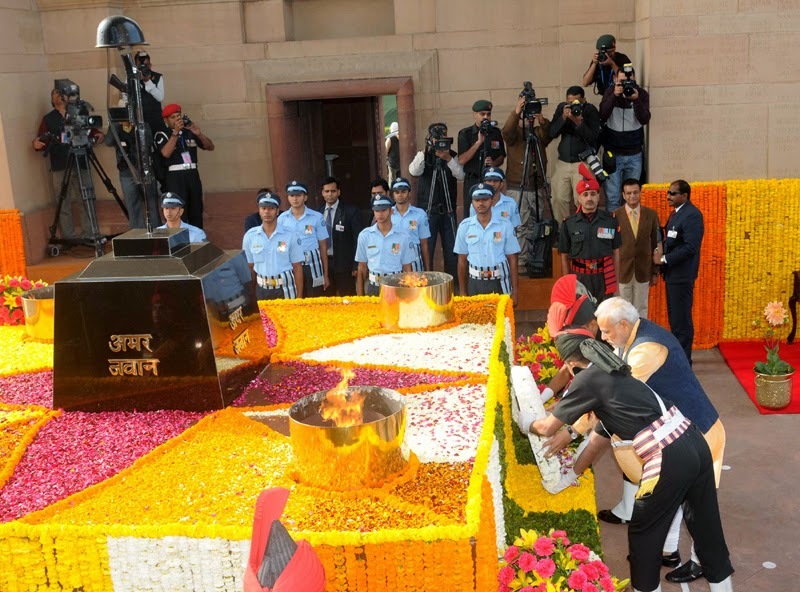 As part of the Commemorative Events, a wreath was laid at Amar Jawan Jyoti, India Gate by The Hon’ble Prime Minister of India, Shri Narendra Modi on 10 Mar 15. 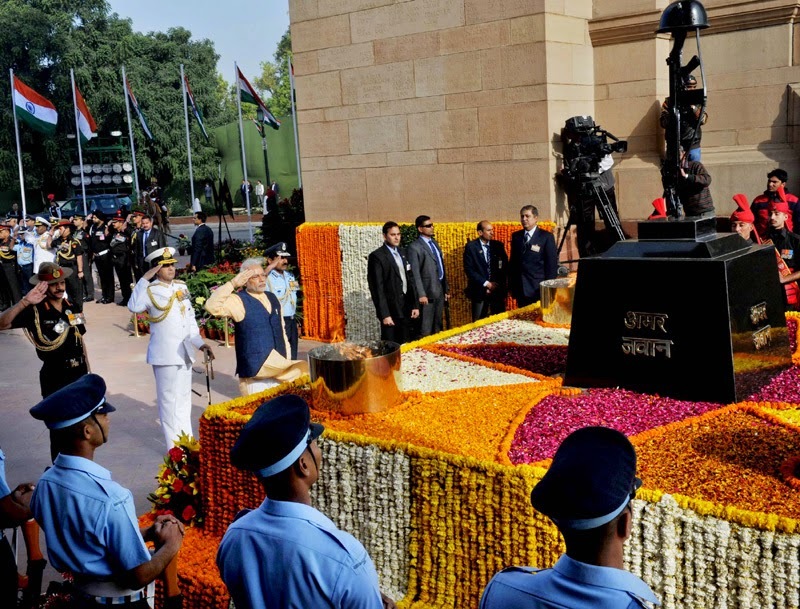 Raksha Mantri, Rajya Raksha Mantri, Service Chiefs, Defence Secretary and senior serving officers of the Regiments that took part in the War, also graced the occasion. A Commemorative Exhibition is also being held at Manekshaw Centre from 10 to 14 Mar 2015. A Veterans Run to be flagged off by Vice Chief of Army Staff will carry the inaugural Flame ‘Heritage Torch’ from Commonwealth War Cemetery, Brar Square to Manekshaw Centre, Delhi Cantt. The last Veteran Runner Honorary Captain (Retd) Bana Singh, PVC, will hand over the ‘Heritage Torch’ to the Hon’ble President for lighting the symbolic ‘Flame of Remembrance’ (Inaugural Flame) and inaugurating the Commemorative Exhibition at 6 PM today. The Chief of the Army Staff will address the dignitaries and highlight the role and sacrifices of the Indian Soldiers during the First World War. The President will thereafter release a Commemorative First Day Cover. The President will also view the exhibition which includes a ‘Gallantry Hall’, highlighting how the ‘Great War’ was fought and won, its impact on Indian Soldiers lives on the frontline and at home. It will showcase 13 Campaigns, wartime weapons and equipment, memorabilia and various artifacts. The ‘Corner of Remembrance’ in the exhibition will display old letters, an old home in neglect with belongings of Soldiers and depicting a feeling of anxiousness of the families waiting for their dear ones to return home. 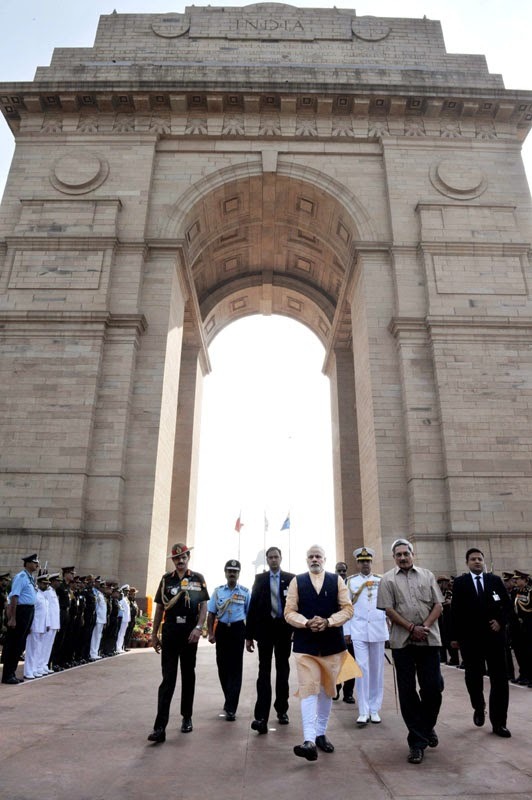 The ‘Sacrifice Hall’ will include replicas of Amar Jawan Jyoti, Indian memorials, busts and paintings of Victoria Cross Winners in India & abroad. The outdoor props of the exhibition will give a glimpse of the dress, equipment, bunkers and guns. A replica of miniature Brighton Hospital will depict the treatment and the trauma that the Indian Soldiers went through. The live props will highlight the role played by various Arms/Corps in the War including Infantry, Cavalry, Artillery, Engineers, Signals and ASC. A dynamic band display by the Indian Army brass & pipe bands will also be conducted as part of the mega event. The descendants of some of the Victoria Cross Awardees and the Param Vir Chakra Awardees of Independent India will also be present for the function and will interact with the Hon’ble President. 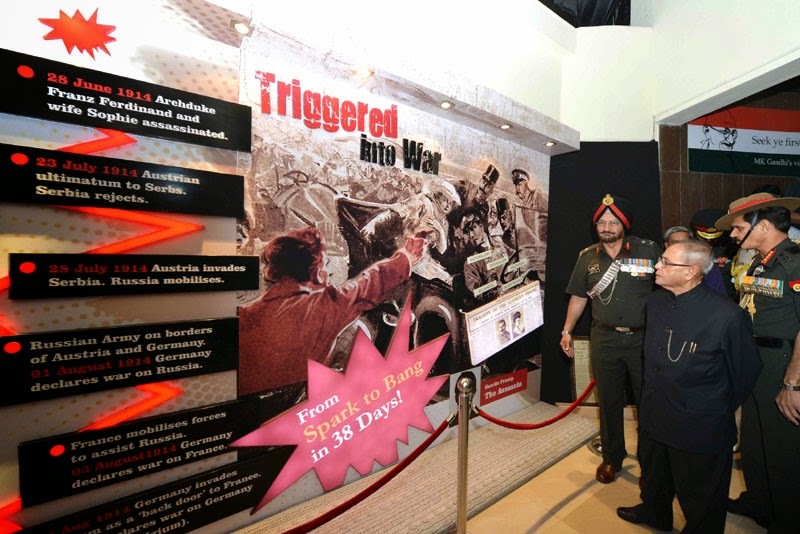 The Commemoration Exhibition of World War -1 at Manekshaw Convention Centre at Delhi Cantonment would be open to the public and Schools and Colleges from 11 to 13 Mar 15. As part of the centenary celebrations of World War I, the Hon’ble President of India, Shri Pranab Mukherjee inaugurated an exhibition highlighting the role of India in the Great War at the Manekshaw Centre this evening. It may be noted that by the time the war ended in 1918, the Royal Indian Marine had transported or escorted 13,02,394 men, 1,72,815 animals and 36,91,836 tonnes of war stores. The Royal Indian Marine suffered 330 causalities and 80 of its personnel were decorated with gallantry awards. It is a lesser known fact that the Expeditionary Forces of the Indian Army that travelled to France, Africa and Mesopotamia to participate in the Great War were transported largely on board ships of the erstwhile Royal Indian Marine, which was the fore-runner to the Indian Navy of today. In fact, the convoy transporting the first division of the Indian Cavalry to France sailed within three weeks of the Declaration of War, on 25 Aug 1914. At the outset of the war, a number of ships were fitted out and armed at the Naval Dockyard in Bombay (Mumbai today) and the Kidderpore Docks in Calcutta (Kolkata today). The Indian Marine also kept the harbours of Bombay and Aden open through intensive mine-sweeping efforts. Smaller ships of the Indian Marine, designed for operations in inland waters, patrolled the critical waterways of the Tigris, the Euphrates and Shatt-al-Arab, in order to keep the supply lines open for the troops fighting in Mesopotamia. There was even a hospital ship operated by the Indian Marine to treat wounded soldiers. In all, the Royal Indian Marine played a vital role in supporting and transporting the Indian Army throughout the Great War and their gallant contribution can be viewed at the exhibition.